Is the Chinese search giant a worthwhile buy after big sell-offs in 2018? 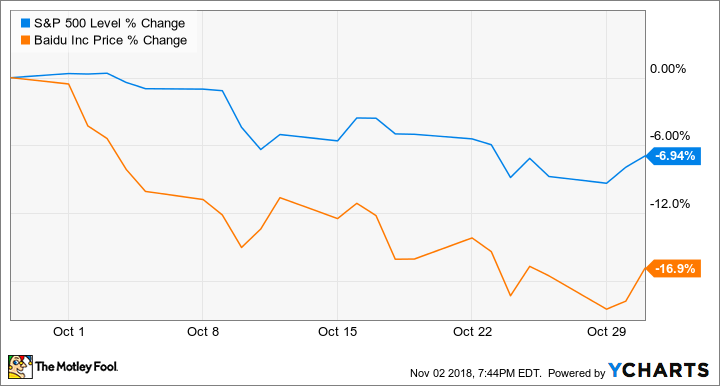 Shares of Baidu, Inc. (NASDAQ:BIDU) dipped 16.9% in October, according to data provided by S&P Global Market Intelligence. There wasn't much in the way of company-specific news behind the sell-off, but the stock lost ground amid a broader market pullback. Chinese tech stocks have been especially hard-hit in 2018, with the Invesco China Technology ETF trading down nearly 30% on the year as concerns about an economic slowdown and heightened trade tensions with the U.S. have weighed on performance. Investors should recognize the potential for continued volatility in the sector, but it's worth looking at whether sell-offs have created opportunities in leading companies like Baidu. Baidu stock regained a bit of ground late in October following a rebound for the broader market and a solid third-quarter earnings release. Despite the stock trading down nearly 20% year to date, Baidu has been delivering impressive earnings results -- with 27% year-over-year sales growth and a 46% year-over-year increase for net income in its recently reported September quarter. That's strong growth for a company trading at roughly 20 times this year's expected earnings. Investors may have been more bullish on the earnings report were it not for fourth-quarter guidance calling for sales growth between 15% and 20% (between 20% and 26% if businesses that Baidu is divesting from are excluded from the comparison), which some viewed as reflecting economic slowdown in China. However, Baidu's outlook remains promising. The company's core search and advertising business only operates in Asia, and while the potential for slowing macro growth in China is something investors should keep in mind, the business isn't otherwise exposed to trade war risks. The stock may continue to see sell-offs in line with the broader Chinese tech sector, but Baidu has a solid core business and strong positions in emerging tech trends like artificial intelligence and automated vehicles -- and its shares look cheap for long-term investors.